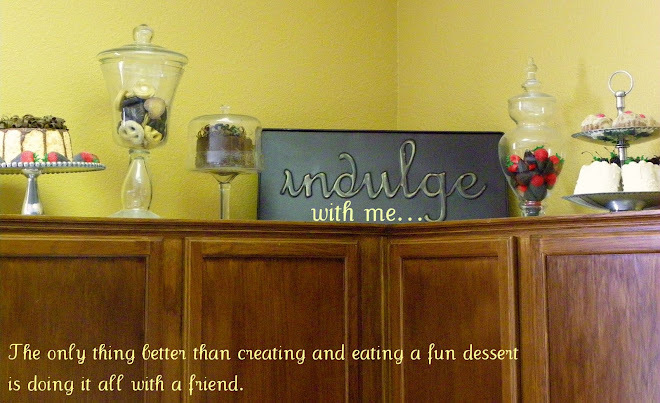 Indulge With Me: Accessory Cupcakes! Jill and I made these for Mindi's Shower. They were so fun! Since the high heeled shoes took so long to decorate and we knew no one would want to eat them with all the sprinkles we made these as well. My dad was in town and helped mold the pearl necklace and the purses. He was so cute! The high heeled shoes were a process but well worth it! We used a white cake mix so you could really see the design on the liners. We did use some grease free but they don't have many designs. Next we dipped Milano cookies in white chocolate and cut a L shape off the end of the cupcakes. We frosted the cupcakes(including the L shape) and the edge of the Milano cookie then dipped them in a bowl of sprinkles covering them. Try not to get any on the L shape. We used white chocolate to add the Pirouette stick(which we cut to the size of heel we wanted) to the cookie and stuck the end of the cookie in the L shape. Most of them dried pretty good that way but others we had to hold until they dried. You may need to add more sprinkles to the edges where the cookie is. Now the fun part...decorating! We used bubble gum and frosting for these. Pre made fondant flowers I found at Wal-Mart. Thanks Jill for the fun!